When we moved in we had a fairly grotty shed so we wanted to make better use of that place in the garden. 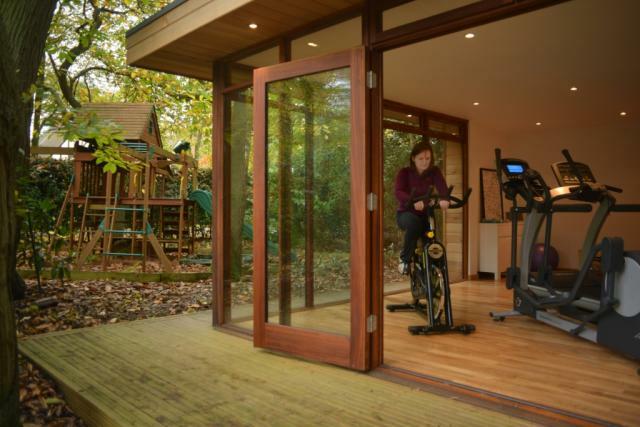 We basically wanted a space to work out in, so we decided to develop a gym in the garden, rather than in the house. What were the key elements that made The Garden Escape stand out from the other providers? We live in a very rural area, and one of the main things that we wanted was a wooden space for our gym, so that it would blend in to our surroundings. After some extensive research on the internet, we found that The Garden Escape could provide us with a wooden space, whereas all of the other ones on the market were made out of either plastic or metal. The moment I saw it I thought that was perfect, just what we want. I’m incredibly proud of the building and love the fact that it allows me to exercise in the way that I want early in the morning. When I’m in it I feel like I’m somewhere different and yet it blends in so well with house. As well as adding value to the house, one of the benefits for us is our Garden Escape’s adaptability. For example, at the moment, we are using the space as a gym, but as the children get older we could turn it into a teenagers’ den.